A day long thought impossible is upon us...the X-Plussies laughed and howled, certain of their collecting superiority...CONFIDENT that the 25cm Giant Monster Series (a.k.a. "large monster series") would never see reissuing through Diamond...Rumors of Tuna stank organizations sitting on the distribution rights to this Godzilla series have turned out to be unfounded though! Diamond has revealed the first wave of 25cm Godzilla figures! Keep in mind, prices and release dates are ALWAYS subject to change. Our "Shipped" pre-order prices are only good in the US. There will be additional costs for overseas customers, which includes Canada. Images used are also taken from X-Plus' original Japanese releases, and final US releases can differ (as X-Plus is known to do...). As always, be sure to subscribe to the blog in order to get the most up to date details on these and future X-Plus releases. Vampire Robots Now Accepts Apple Pay! As of right now, you can use Apple Pay when checking out on our website. If you're using iOS 10 on your phone, and/or Apple's MacOS Sierra, then you can instantly purchase from anywhere with a simple tap and click, using your saved payment and shipping information! "BUT MASTER CONTROLLER MIKE! HOW DOES THIS WORK?! I DON'T UNDERSTAND ALL THE THE THINGS!" iPhone SE, iPhone 6, iPhone 6 Plus, and later. iPad Pro, iPad Air 2, iPad mini 3, and later. Apple Watch paired with a supported iPhone. Vampire Robots' 2017 "Year Of The Monster" Convention Tour! As we march deep into the heart of the year of our lord 2017 A.D., the convention season here in the Northeast corridor slowly begins to cycle up! Here at Vampire Robots HQ, we're gearing up for our biggest, busiest convention year yet! In fact, we're so excited about this year's line up of conventions, we're calling it "The Year Of The Monster" tour. Why "Year Of The Monster"? Well...frankly, three of the first six conventions this year have the word "monster" in their names. Two of the six that don't are still oriented to movie monster fandoms and collectibles, and well, if you don't see why its called that at this point, why are you even reading this blog??? Situated within close proximity to our HQ outside Philadelphia, this is our Go-To local show. This will also be our seventh MM appearance as a vendor. The march MM is usually our first real event of each year, and, like you, the attendee, we've been couped up all winter and are jonesing to get out! We also get a stock pile of awesome merchandise through the holiday season that often doesn't get seen by eyes other than our own until this show! Because of all this, we tend to go BIG at the March show, and this one will be no exception. We've got lots of brand new stuff that's been saved up, as well as lots of planned show specials. We're intent to come out swinging at this one and make it our biggest and best MM to date! Our first First Time event of the year! This will be our first time at MMP EVER! This will also be Vampire Robots' first convention down south! We have yet to venture past the DC area and we're looking forward to this one! We'll be haulin' a sampling of everything we stock, and are looking forward to meeting some new faces, and maybe putting a face to customers we've only previously dealt with through the web store. Learn More about MAD MONSTER PARTY! We'll barely have enough time back from MMP and South Carolina to shake the dust off our boots before we jump right into our next BRAND NEW EVENT for 2017! 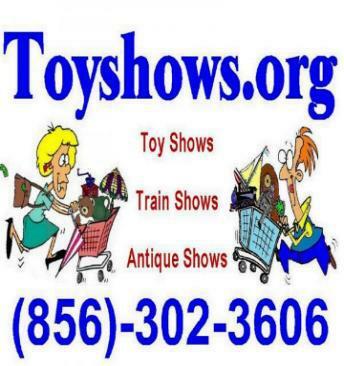 One of the longest running toy shows on the east coast, and a great place for vintage toy hunting. We'll be bringing some vintage items out for this. Another tried and true convention on our circuit! The April Chiller tends to be our favorite of the two chiller events each year, and with the return of Godzilla related guests from Japan this year, we expect it to be a call back to the "good ole days" for east coast Godzilla nerds! Its also moved back to the Hilton Parsippany, so it will be our first time vending at Chiller at this venue, one that seems to be preferred among its long time vendors. Learn More Chiller Theatre Expo! We've wanted to add this convention to our roster since the very beginning of Vampire Robots, and this year, we finally do it, just in time for Monster Bash's 20th anniversary! Learn More About Monster Bash Conference! Our annual big event for the year. This one might be our biggest G-FEST yet! In addition to returning guest Shinji Higuchi, co-director of the recent SHIN GODZILLA, G-FEST will have legendary Japanese Sci-fi/Fantasy artist Yuji Kaida in attendence for the first time ever! Learn More About G-Fest XXIV! This is just the first HALF of 2017! We're planning to book plenty more conventions and shows through the year. There's at least one more Monster Mania in the cards for us, and Chiller's Halloween weekend expo. There might even be a few surprises. Be sure to subscribe to the blog here (right there on your right...see it? No, no, There! You've got it now...), and also be sure to like our Facebook pa, follow us on Instagram, and Twitter for more convention updates. As of this past friday, 12/2, we've started accepting paypal at checkout! At long last, you can use paypal at check out when purchasing from Vampire Robots! It's something we've wanted to integrate with the the site for a long time, but just couldn't, due to the site being hosted through Squarespace. We COULD have used it as an option, but it would not have been seamless. Now it is, and so now we have it! This also means we can now officially accept orders from overseas through the site as well! No longer will you customers in Europe or Asia need to reach out to master controller Michael and ask him to awkwardly calculate a shipped overseas price for you. The site can do all that for you now, and you can pay securely with paypal! For more of the latest news in all things Vampire Robots, be sure to subscribe to our blog here! All of these guys are in stock and ready to ship! Baragon, Titanosaurus and Rodan are even on sale! They'll be at these sale prices until they run out. If you've held off getting any of these, now is probably the time to get them. If you need to Christmas shop for a Godzilla nerd in your life, this is possibly the deal you've been looking for to make their holiday. Quantities are limited on all of these, so once they're sold out, they're sold out. We won't be restocking them. As always, for the latest on our sales and other VR news, make sure to subscribe to the blog! EXCITEMENT TIME: Godzilla 2000 v2 from X-Plus USA! So here is an item that master controller Michael has been quietly waiting in anticipation for since it was first teased at San Diego Comicon this past summer. A second edition of Godzilla'00 from X-Plus! Why is this so exciting, especially when the original 30cm is slated for reissue, an item long considered by many X-Plus-heads to be a grail item? Well, for kit builders, this was once the KOC vinyl kit! 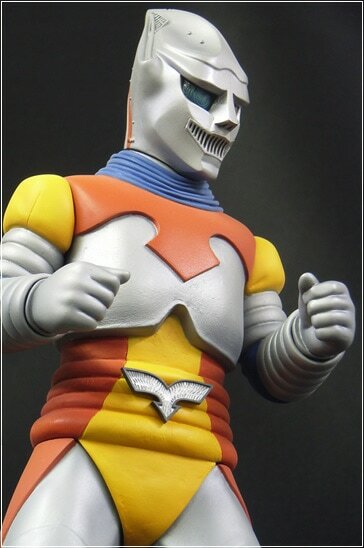 While not quite the same height as the regular X-Plus 30cm series (he comes in at 28cm) this release can be equated to the Sakai releases in the series (also being reissued in the US in 2017), without the heavy Sakai price tag! Now the photos shown here are of someone's build up of the original vinyl kit from KOC. 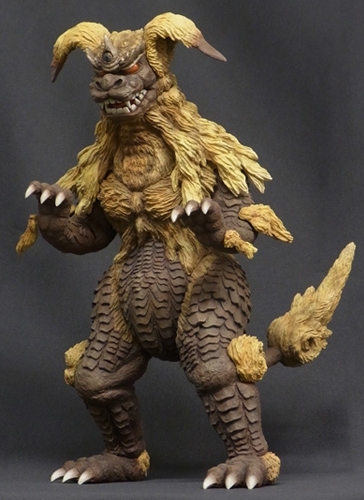 You can look at more of them at http://gemini555.com/koc-godzilla2000/koc-godzilla2000.html. There will be a photo at the bottom here of what X-Plus prototype looks like. WHY is Michael so excited about this release though? Well, the 30cm is clearly more accurate. Its safe to say it really nails that suit, BUT, its also a very static pose. This one on the other hand, has a much more dynamic, engaged pose. He's got more of a battle stance, ready to take on Orga, or the dweebs who dubbed his movie for US release! Also, this kit has long been on Michael's want list since his days as a kit builder. Expected to released 7/27/17, the suggested retail on this guy is $160.00. Pre-Order price with Vampire Robots is $160 shipped in the US, or $195 shipped overseas. You can place you order here. The Independence Day Sale At Vampire Robots! The second of our two big summer sales is about to kick out the jams! Yes! It's so exciting even Gonzo journalist Dr. H. S. Thompson might return from the great beyond for it. Starting tomorrow, Saturday, June 25th at 7am EST, and running until Wednesday, July 6th at 11:30pm EST, you'll be able to apply the promo code "STARSPANGLEDTOYS" at check out to receive 20% off your total order. In addition to that, a number of in stock items will be on sale! Things like our exclusive Burning Godzilla from the Godzilla Vinyl Wars line, or the Shogun Warrior Boba Fett from Funko! You can apply the promo code to whatever the sale price is for even bigger discounts. Even brand new items arriving from NECA during the sale are applicable! Celebrate this great nation's day of independence by partaking in rabid consumerism, the way God and the Founding Fathers intended! NOTE: Sale is open to US customers only. Promo code not applicable to new or existing pre-orders, or special order items. GODZILLA OBLIVION # 4 SPECIAL G-FEST GIVE AWAY! SURPRISE! We're going to have TWO GODZILLA OBLIVION #4 covers for G-fest. What the hell is happening exactly? Read more below! As some of you are already aware, Vampire Robots has commissioned a special exclusive cover of IDW's GODZILLA OBLIVION issue number 4, with art by comic artist, G-fest regular, and all around mad man Jeff Zornow. Limited to 1200 copies, and only $5, these will be available exclusively at the Vampire Robots table at G-fest july 15th through the 17th. So what do those first 50 attendees have to do to get this fine item? Well, its FREE! Free with any purchase of $10.00 or more that is...The first 50 attendees to spend $10 or more at the Vampire Robots tables, starting G-Fest Friday, July 15th, will get this variant cover with their purchase. Since we'll only have 50 copies available, there is honestly a very good chance you will miss out, if you do, don't dispair! We'll be donating an additional 20 copies to that wonderful gentleman David Nunes and his "G-FANS Helping G-FANS" initiative. You'll have an extra 20 chances to get a copy the rest of the weekend, and you'll be helping a good cause too! You can find out more about G-Fest, and how you can also contribute to G-Fans Helping G-Fans here. Of course, you'll still be able to pick up our exclusive variant cover of GODZILLA OBLIVION issue number 4 all weekend long, or while supplies last at least. As always, for more updates on this, and other products and events, subscribe to our blog, Dispatches From Master Control! Godzilla'92 & Godzilla'84 30cm Vinyl Figures from X-plus, currently available for Pre-Order at Vampire Robots. 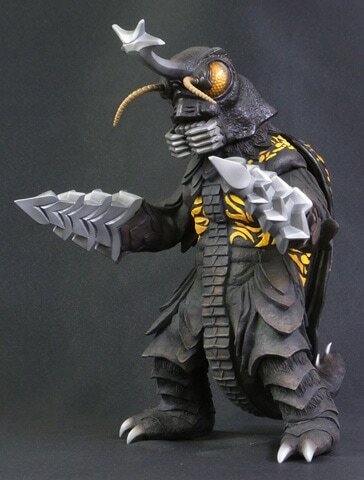 So we've made a price adjustment here at Vampire Robots on the following two X-Plus Godzilla figures. Originally solicited from Diamond Comics Distributors as $169.99 MSRP, they've been adjusted to $160.00. Our pre-order price on each is $160 Shipped in the US ($195 shipped overseas). If you already pre-ordered these guys with us, you don't need to do anything. Your order total has already been adjusted accordingly. As always, prices and release dates are subject to change. For up to date news, subscribe to our blog (right there, on your right! ).